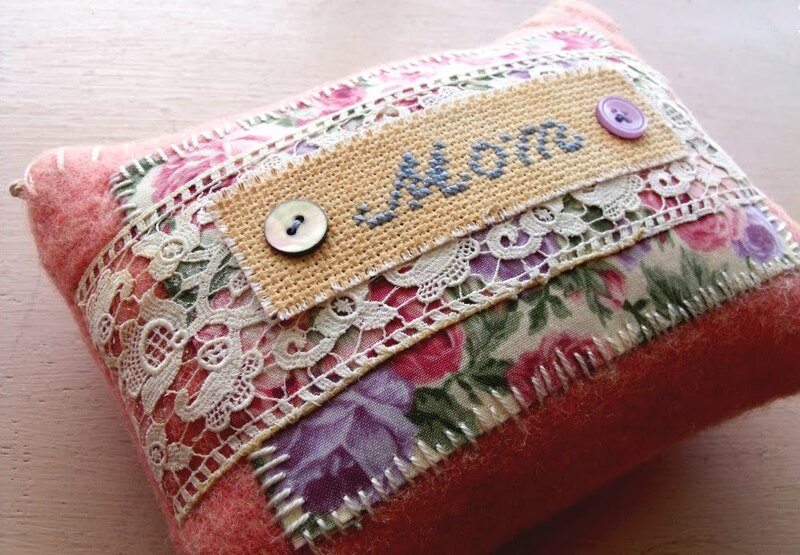 My Mother's Day Vintage Wool Pillow has been chosen as one of the items in the latest Voter feature on Etsy! If you're not familiar with Voter, it's a chance to browse some themed items selected by Etsy and pick your favourite. There's no prize, just a bit of fun. But it's great exposure to be picked, I am delighted! 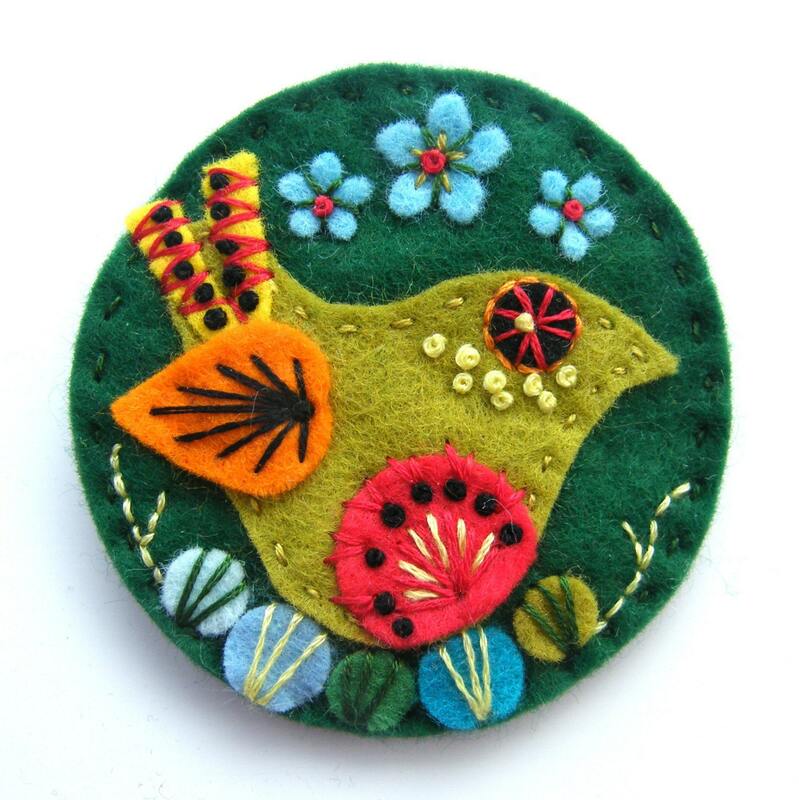 I love this artist...the designs in her felt brooches are so simple but so effective. 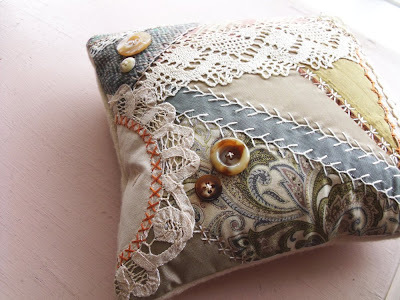 The colours are so rich and well matched, and the textures and symmetry just make these so appealing to me. 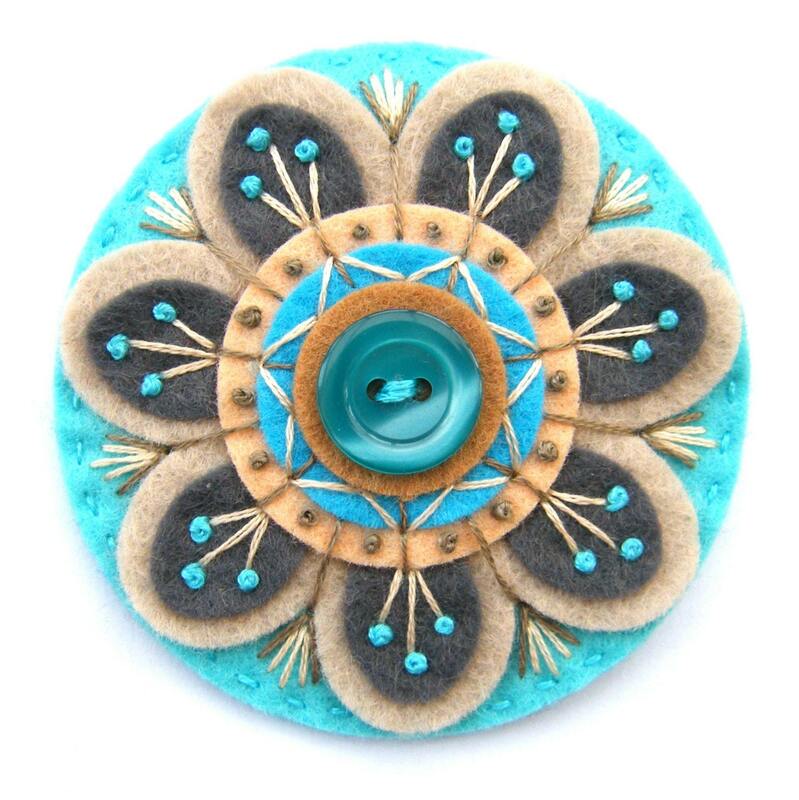 Buttons and felt! Love it. 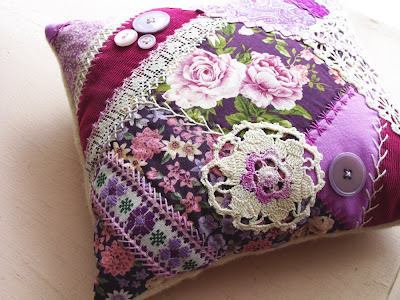 I like using wool felt, I like it for making pincushions and pillows, and I like how it looks with the edges pinked. 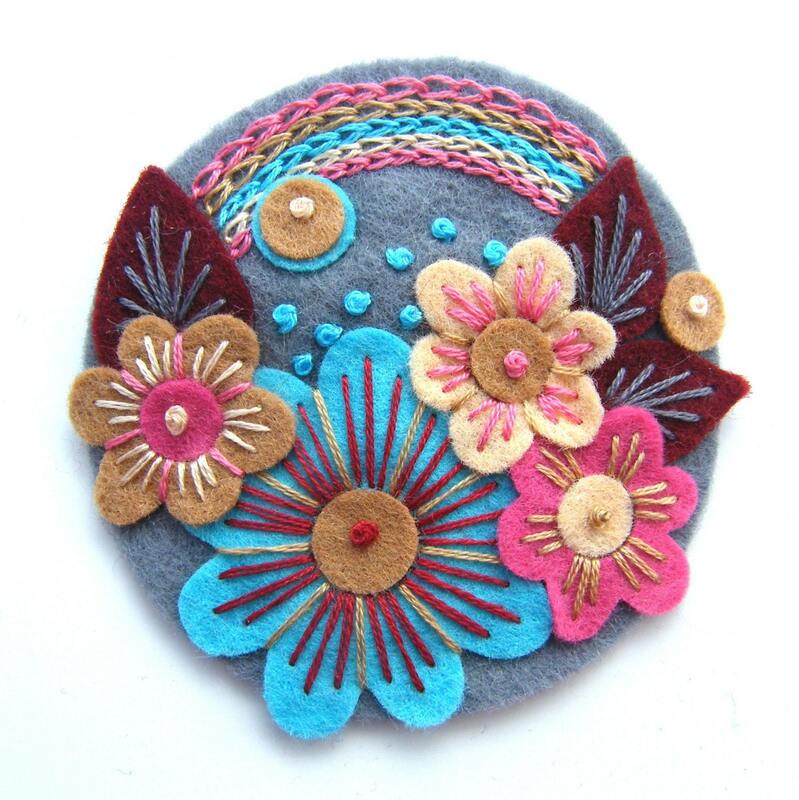 These fabulous brooches have inspired me to try appliquing felt on to some of my crazy quilts, I often use felt as patches but it hadn't occurred to me to make shapes, flowers, etc. Something to experiment with! 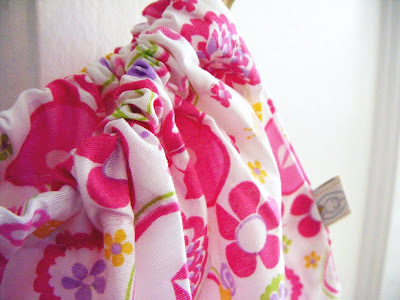 Designed by Jane has loads more designs in her Etsy shop, including some cuffs and bags and crocheted pieces. Yummy eye candy, well worth a look! My husband, son and I live in a little estate in a small village in Co. Cork. 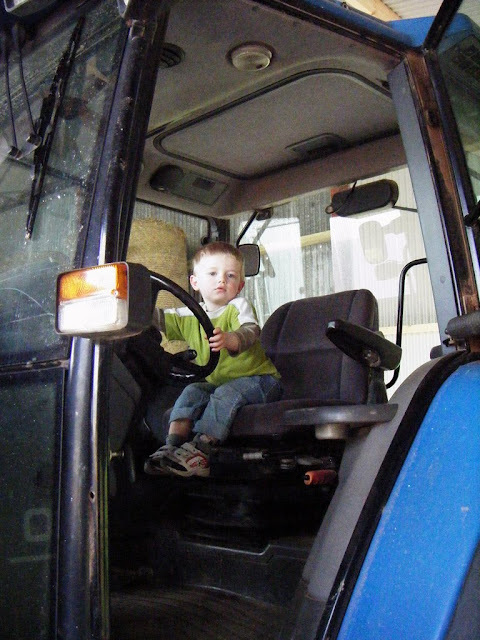 Our house backs on to a farmer's field, and if my son Henry stands in his crib and looks out the window, he sometimes will catch the farmer tending the crop in his tractor. This has triggered a tractor *obession* with Henry, the first word out of his mouth when he wakes is tractor (quite literally). "What's that? A tactow! What's that? Wheew? What's that? TACTOW!!!" Yesterday I went to collect my car from my mechanic, who is also a farmer (Ireland for you), and he let Henry 'drive' one of his tractors! Well, we've now created a Tractor Bore. We will never hear the end of it. "Where is the tactow? Where did it dow?" 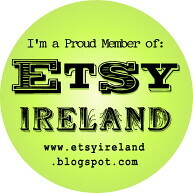 Tomorrow, Etsy will be running Treasuries from the trial Treasury East on the front page all day! So I took the time to make up a couple of Treasuries because you never know. I have been choosing one of my own items as a starting point, and then hunting for items with similar colours to create a theme. I set myself a challenge of trying to include supplies and vintage items, not just handmade...the supplies often end up being the most effective! The new Treasury East ranks the lists by the number of views and clicks they receive. 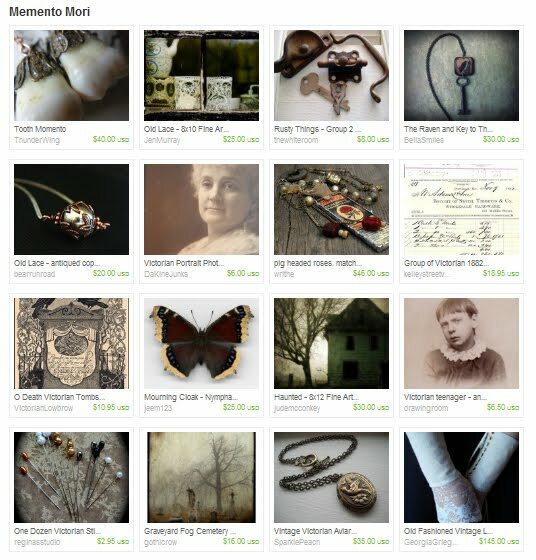 So if you visit the Treasuries, always be sure to click all the items on your favourites! 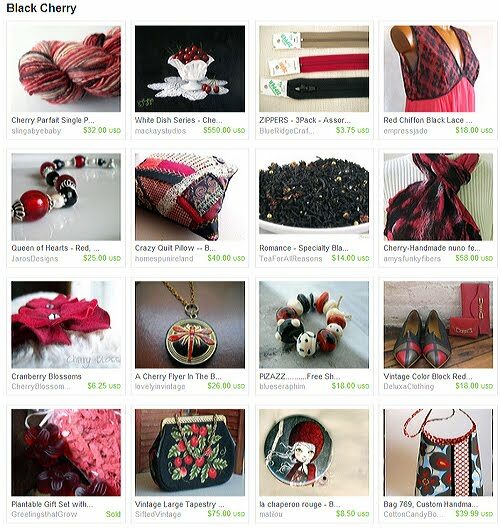 Visit my treasuries....Night Garden and Black Cherry. I made pickles today! Three litre jars of bread-and-butter pickles. Lidl had pickling cucumbers for sale so I brought home half a dozen. Last time I visited my Aunt Sandie, she gave me some vintage canning books. 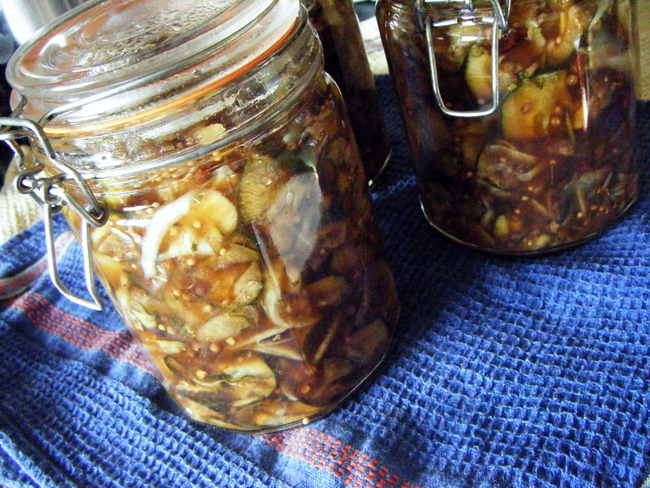 She does tons of canning, and makes the best bread-and-butter pickles ever! 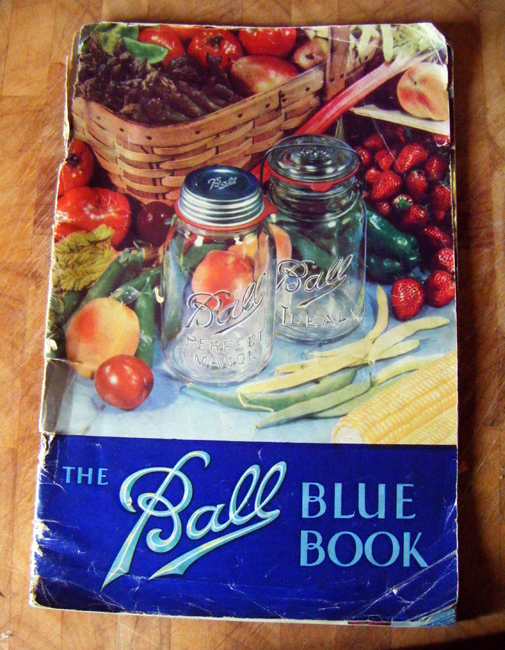 The jars here are the French type canning jar, with the steel hasp and rubber gasket, and old canning books have instructions for using them. The recipe I used called for brown sugar instead of white, and also cinnamon and ginger, so the pickles have a dark sweet syrup. They are really strong and aromatic. Such a treat to have bread-and-butter pickles in Ireland! And three big quart jars, I'm rich! I had money in my Paypal, so I thought I'd treat myself to a new handbag. A 12%-off-all-bags sale on DaWanda--Europe's answer to Etsy--sealed the deal! 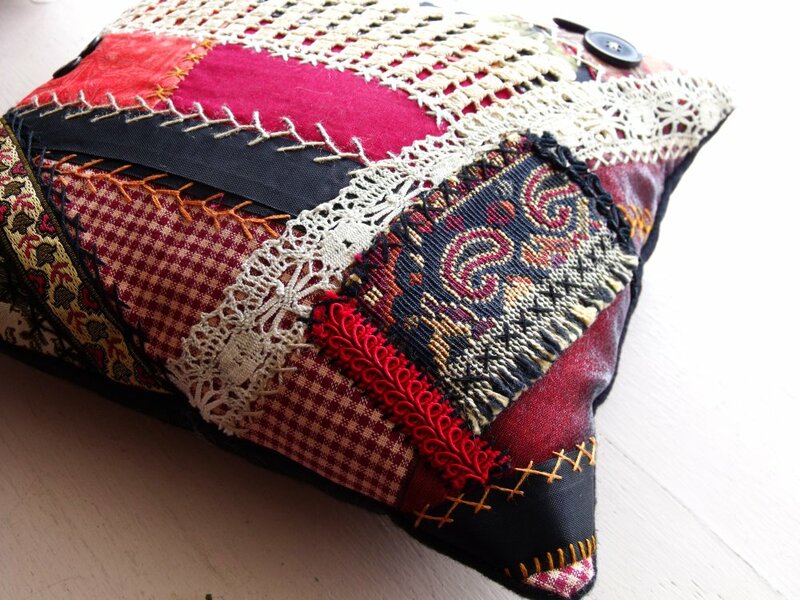 I've been pining for a bag from Etsy seller Bayan Hippo for ages, and lo and behold, she has a DaWanda shop, too! So I got this beautiful colourful new bag just in time for summer. 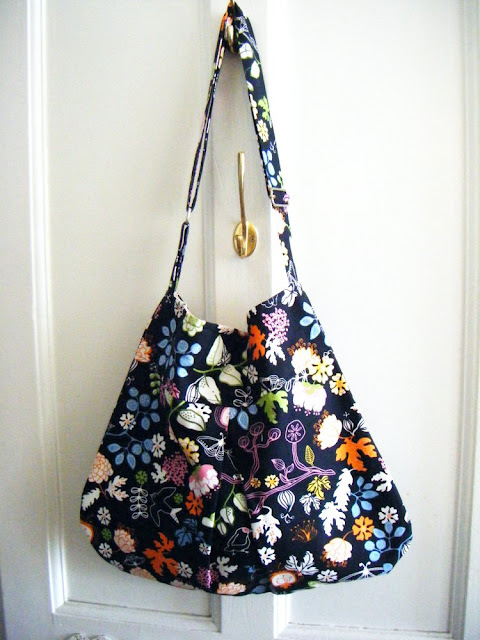 It is just exquisitely made, with roomy pockets inside and a clip to hold my keys (find? my keys?? crazy.) 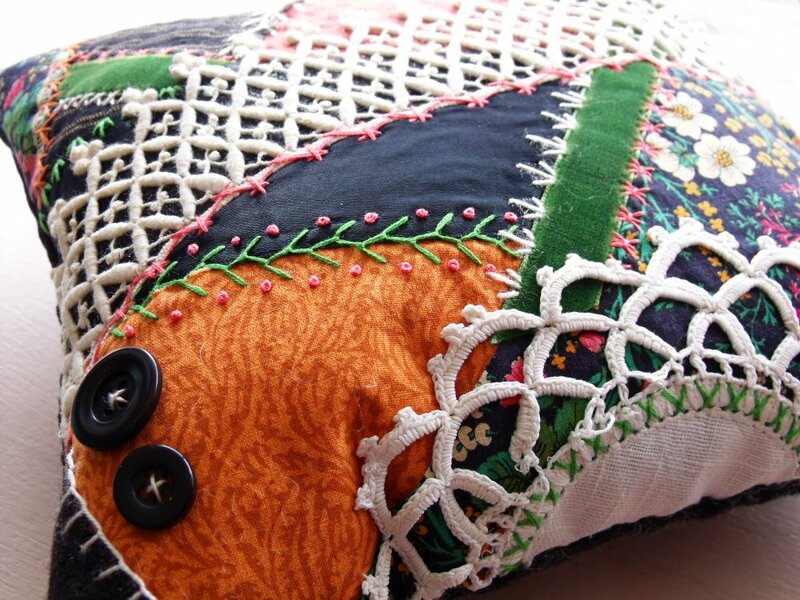 And she adds such lovely generous details, for instance the bag is shipped inside another colourful fabric drawtring bag! Mine is a fruity pink print. 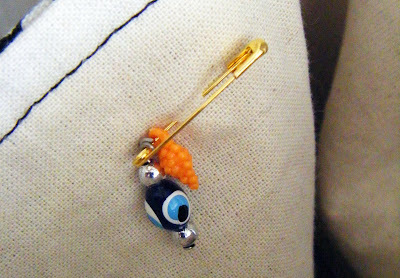 And she pins a few little charms and beads inside, including a lucky 'evil eye' bead, as she is in Turkey. I just love little details like that! My grandmother was in the Workers of Mary when I was a girl. One of the things they would do is get together and make rosaries and scapulars to sell. Those ladies were all so crafty, they made everything, it was a virtue. So when they got together to do their Mary work, it's not surprising that they decided to make Catholic crafts. I have a big box of vintage French prayer cards that I won on Ebay years ago, literally hundreds of them. They are amazing, the illustrations and printing are exquisite. Some of them are even hand painted, presumably by French nuns. Those French nuns could have taught the Workers of Mary a thing or two about Catholic crafts. 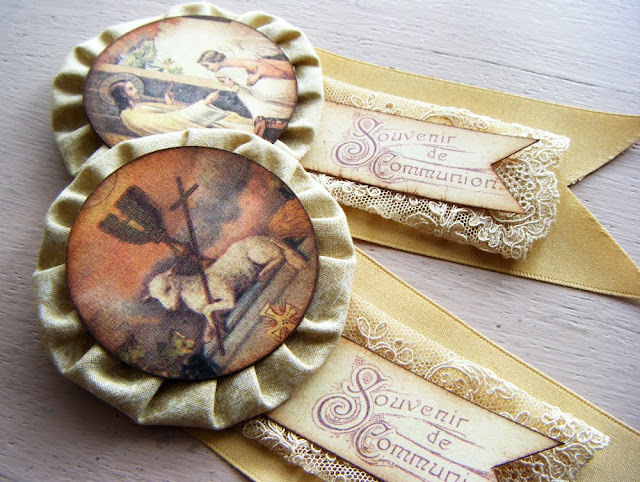 So when I got a notion to make Communion rosettes, I hunted through the box and picked out some of the Communion souvenir ones to use. Also in the box was a scapular, still in the packaging, that I must have bought at some point. It just appealed to me, a little felty thing on a string. 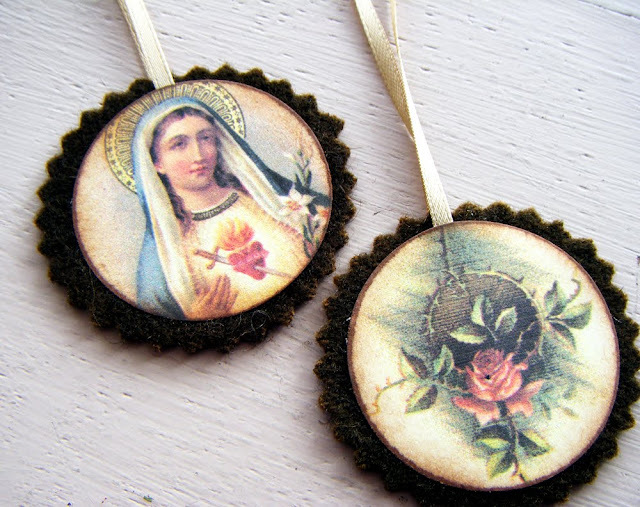 I adore felty things and holy pictures and string, and soon I was making scapulars. I thought for a minute that it might be a completely mental thing to make, but then I remembered the Workers of Mary, my Grandma and her old lady buddies all sitting around nattering while making rosaries and scapulars, and then it seemed kind of nice. My fascination with Catholic accoutrements has little or nothing to do with the Church, it's just about my Grandma and making pretty things. Everything is about making pretty things. Learn more about my Communion rosettes and scapulars in my Etsy shop. Little crazy quilts are my favourite things to make right now. The process is so cathartic. I love sitting at my sewing table and going through all of my fabrics and lace and trims and ribbons and arranging and rearranging, not even thinking too hard about it, just waiting until I feel all "oh, whooo!" and knowing that's how I want it. 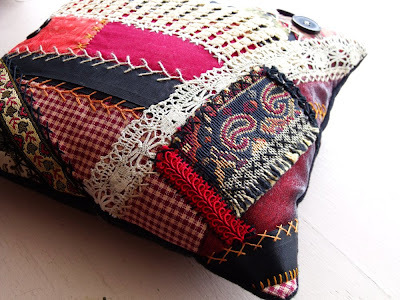 And then I pack my quilt into my little sewing case, and keep it with me all week, sneaking a bit of embroidery every chance I get. With little two year old hands grabbing all the time..."No, Henry, that is mama's!" over and over and over. And then eventually I reach a point were I can't think of anything else to embroider, all done. I made four little quilts in this last batch, always make at least two of something for some reason, or three or four. 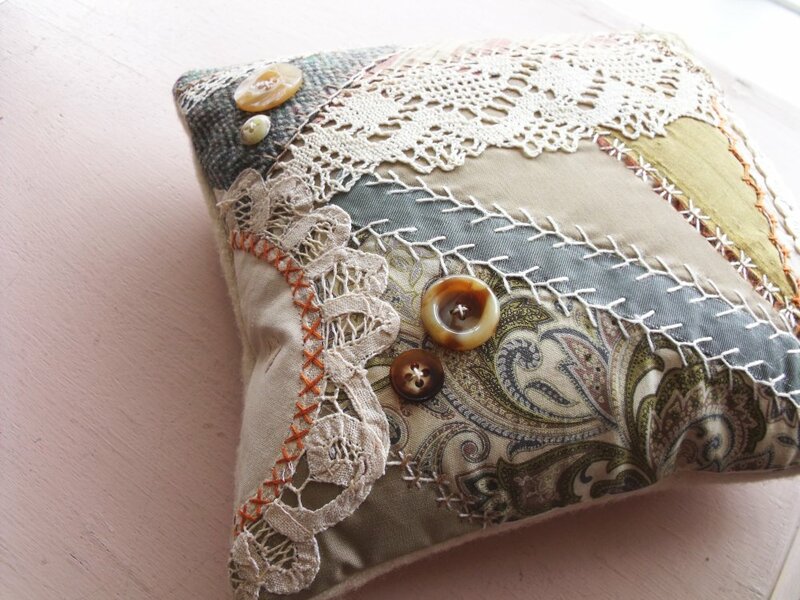 I made them into little pillows so that they seem useful. These four have nothing to do with each other, all different colours, but all pretty much the same for me, in the process. Etsy is having a trial with 'Treasury East', which opens up the Treasuries to everyone. 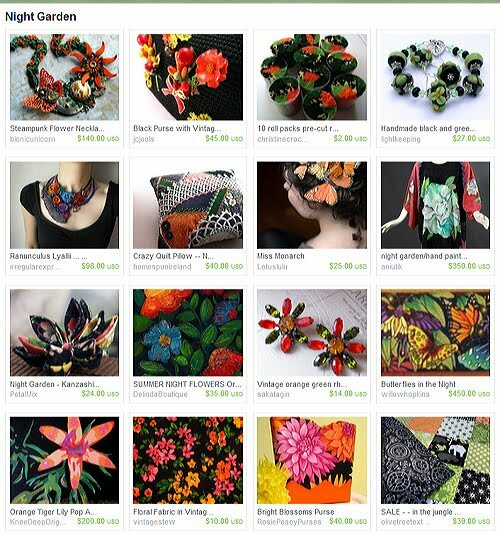 If you're not familiar with Etsy's Treasury, it's kind of a like the lists you can create on Amazon, collections of items grouped together by a colour or theme or whatever reason. The items on the front page of Etsy are often treasuries created by Etsy buyers and sellers. Previously, in order to publish a Treasury, you had to watch the old ones expire until the perfect moment where you have about ten seconds to snag one. I've never had the patience to try, to be quite honest. But since Treasury East is as easy as copying and pasting, I thought I'd have a go. I ended up putting together a spooky selection, inspired by those fascinating tooth earrings...muahahahaha. I have a habit of buying journals and sketchbooks, and then just keeping them forever blank because I'm afraid to write on the first page.